Garry Monk says he has "no plans any time soon" to leave Swansea City and hopes to commit himself to the Premier League club by signing a new contract. The 36-year-old has two years left on his current deal at the Liberty Stadium but Swansea have already begun preliminary talks over a new deal. "Of course I'm ambitious but I have no plans any time soon for that to be changing," Monk said. "But who knows in the future what happens?" Monk has impressed in his first full season in charge at the Liberty Stadium, leading the Swans nine points above their previous best Premier League points total with two games to go. Swansea will also record their highest Premier League finish of at least eighth, while they could yet claim a place in next season's Europa League if results go their way. Monk has led the Welsh team to league doubles over both Manchester United and Arsenal just over a year since being placed in charge following the sacking of Michael Laudrup. 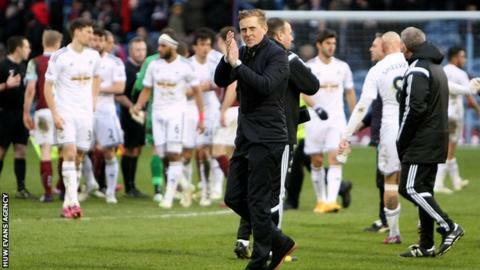 "You either do well and possibly move on, or you don't do well and you get sacked," Monk added. "It's going great at the moment, I'm really enjoying it and I want to try and commit to Swansea for the future. "We'll sit down and go into detail in the near future, whether that's in the next few days or weeks we'll see. "It's just a busy period at the moment to sit down face to face with my agent and the club and everything like that, it's just getting the right time. "It's an ongoing thing right now but we've only really started to speak at the start of this week and the end of last week, but it was just to say let's make sure we find a time to make sure we sit down and go into it in detail. "It's like any contract, it's for an agreement to be made. But the agreement takes time, there are two sides to it." Swansea's rise up the table this year has led to calls from his peers, such as Crystal Palace's Alan Pardew, that Monk should be named Manager of the Year. He has also been linked with moves to other clubs including West Ham United and the Swans are keen to reward Monk for the job he has done. But the club's former captain admits that whatever the future may hold, Swansea will continue to be a big part of it. "When I first came I never thought I'd be here for 11 years. The thing in football is that it changes very quickly, you're always mindful of that," Monk said. "I'm very focused on Swansea, my kids were born in Swansea, I'm a big part of this community. I've loved living here for the last 11 years. "Whatever happens in football I'll always come back here and this is where I'll live. So that's how I feel about it but football changes very quickly." The Swans host Manchester City on Sunday in their final home game of the season. Monk has no fresh injury concerns as his side battle with Southampton and Tottenham for a place in the Europa League next season. And Monk believes achieving that goal shows he would be able to reach his managerial ambitions at the Liberty. "Hopefully, that'd be great. Right now we're pushing for Europe, it's a real possibility for us," he said. "For me that would be a fantastic achievement now for me in my career and where I'm at, and for the players and for the club. "If we can achieve that then obviously it'll be another stepping stone. We're a growing club, we're growing all the time. "It's a great club to be part of and it's exciting. It's an exciting project to be involved in, so hopefully to be part of that going forward would be exciting."